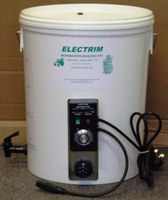 Electrim mashing and boiling bin for use in All Grain brewing. A simple combined mashing and boiling bin that uses a thermostatically controlled heating element to make it easy to mash your grain, sparge it and then boil the resulting wort. This bucket holds 32litres and has a usable working capacity of 25 litres. It has an integrated tap to make it easy to run off the wort. Whilst the bin is primarily designed for use as a boiler and many experienced AG brewers and writers suggest it should ONLY be used as a boiler and that a separate, insulated mash tun should be used for 90 minute mashing period, it easy to use it for mashing and sparging if the grain is contained in a mashing/sparging bag. The new design of this bin in wider than previous models and as a result, the Ritchies Mash bag will not fit correctly around the circumference and the Youngs Mash Bag will need to be used instead if you are mashing or ujndertaking BIAB (Brew in a Bag) brewing. If you are using it as a mash tun, you will also need a separate container to hold the sparging water and maintain it at the required 80ºC during the sparging procedure. You will also require an extra bucket to collect the run off wort and hold it whilst you clean the grain out of the boiler. Once the boiler is clean, you can add the wort and bring it to the boil before adding the hops and boiling for a further 90 minutes.